Benedectine – of the religious order founded in AD 529 by St Benedect. Edward the Confessor ( 1003-1066) – the king of england from 1042 ro 1066. He was considered a holy man , and in 1161 the Pope made him a saint and gave him the title of “Confessor”. Anglo-Saxon – of the Germanic tribes (from North-Western Europe) who settled in England before the Norman Conquest. Gothic – of the style of architecture common in Western Europe in the 12th to 16th centuries, characterised by pointed arches, clusters of columns, etc. William the Conqueror (1027 – 1087) – the king of England from 1066 to 1087. He was the duke of Normandy, in northern France, when the English king Edward the Confessor died, and claimed that Edward had promised him the right to be the next king of England. He invaded England and defeated king Harold II at the Battle of Hastings in 1066. Later that year he became king. St Andrew’s Day – the day which commemorates St Andrew, the patron saint of Scotland. Elizabeth I (1533-1603) – the queen of England from 1558 to 1603. She is regarded as one of England’s greatest rulers. Elizabeth was an extremely strong and clever woman who controlled the difficult political and religious situation of the time with great skill. Charles II (1630-1685) – king of England, Scotland and Ireland from 1660 to 1649. He spent most of the time living abroad until Parliament invited him to return to be king after the death of Oliver Cromwell. Henry VIII (1491-1547) – king of England from 1509 to 1547. He is one of most famous of all English kings, especially because he had six wives. Publican – a keeper of a public house (pub), a place licensed to sell alcohol to be consumed on the premises. The Coach and Horses is a typical name for a pub. ü How can you prove that the statement “Westminster Abbey is not only a historical place, it is part of history in itself” is true? ü What was the motivation behind the “Gunpowder Plot”? ü Were there any occasions when the Big Ben clock stopped? When and why did it happen? ü Why do you think the watermen protested against the construction of London Bridge? Have you ever been to Barbados? Life (1) ________(by/at/on/over) Barbados is slow and peaceful. People there seem to (2) __________(spend/pass/attend/follow) all their time eating and relaxing. You (3)__________(almost/hardly/nearly/scarce) ever see anyone doing any real work. (4)______(Although/Nevertheless/Despite/ Contrary) crowds of tourists are attracted (5) ____________ (at/from/on/by) cheap package deals, the island, situated (6) __________ (among/between/in/on) the Caribbean remains (7) _____________ (undisturbed/unattached/unspoilt/untouched). The temperature seldom falls (8) __________ (under/below/down/behind) 20° C and you are unlikely to meet friendlier people anywhere in the world. In Bridgetown, the capital, you can sit on the balcony of a harbour-front restaurant (9) __________ (swallowing/sipping/biting/eating) fresh coconut cocktails, and watch the boats (10) ____________ (unpacking/disembarking/unloading/delivering). It is also a great place to buy jewellery as not only it is beautifully made, but it is also tax-free. For the classiest hotels (11) _________ (face/head/turn/charge) north to the Platinum Coast, (12) ____________ (called/termed/christened/named) after its white sandy beaches. The superb Glitter Bay Hotel is situated in flower-filled gardens with (13)__________ (careful/attentive/cautious/interested) staff and delicious food. As the sun (14) __________ (falls/jumps/sets/dives), enjoy your cocktail and start figuring out how to (15) __________ (take/earn/gain/possess) the money to get back to Barbados. Tuscany has much to offer the visitor as it has both beautiful countryside and a number of historic towns. One of its (1) _____ famous cities is Florence, (2) _______ is known for its cathedral and the beautiful bridge, Ponte Vecchio. In (3) ______, there are some colourful markets, which are quite cheap considering (4) _______ expensive Italy can be. Another city most people will have heard (5) ________ Pisa, famous (6)_______ its Leaning Tower. That is not the only attraction (7) ________ seeing in Pisa, as there is also an eleventh-century cathedral. Bargo, on the other (8) ____________, is a town that may not (9) ________ known to the average visitor. Nevertheless, it should not be missed by (10) _________ who is interested (11) ________ seeing the best of Tuscany. It is full of old buildings which have all (12) ________ painted red, ochre, pale blue and green. The streets are lined with trees and there are (13) _______ restaurants and pavement cafes (14) _____________ you can sit and admire the cathedral and Mount Panio, which lies just behind the town. The atmosphere in this place is (15) ________ charming and restful. A. The Moors were a race of nomads, until they came to Spain. Imagine a quiet corner in Granada’s Alhambra, as the shadows lengthen across the ancient stones. Time stands still. And so it is in countless courtyards and squares in other cities of the region. In Seville, first city of the south. In Cordoba, home of the noblest mosque ever constructed. Meanwhile, back in the 21st century, Andalucia enjoys infrastructure the envy of less historical parts of Europe. Witness the organizational flair that made Seville such a successful host to the world during Expo ’04. But close your eyes to progress for a while. Within the walls of the citadel the stately pleasures of a bygone age hold sway. Little wonder the Moors lingered for eight centuries. B. Big chunks off glaciers! Hurry! Won’t last! Our new season’s Alaskan cruise program and brochure has just been released. And to celebrate, we’re offering sizeable chunks off the cost of voyages to the glaciers and other wonders of Alaska. Book before 2 April 2005 and save with our special Booking Bonus. You could be cruising Alaska for 7 nights from just $3218 per adult, which includes your international return flights. Give yourself a break. A week or so. Even a weekend. However long you need to get back a bit of that old get up and go. At Warburton Health Care Centre, we’ve become very good at recharging people’s batteries. After all, we’ve been doing it for 82 years. Just coming to Warburton is a breath of fresh air. We’ll treat you to good food, in every sense. It’s vegetarian, and better still it’s delicious, we promise you. We’ll give you healthy exercise. We will put the spring back in your step with a bit of bike riding, daily massage, hydrotherapy, maybe some tennis, aerobics, swimming and so on. All under the guidance of our friendly team of fully qualified health and fitness professionals. Warburton Health Care Centre is set in magnificent gardens in the forested foothills of Mount Donna Buang, just 77 kilometres from town, but a world away. Ballathie House is quite unlike any other hotel you’ve ever stayed at. An elegant country manor in an idyllic setting, it offers the best of what is old and gracious with the best of what is modern and convenient. All the ingredients, you might think, for the perfect weekend break. Yet its uniqueness, oddly enough, is what makes this a typical Best Western Hotel. There are nearly 200 to choose from all over the UK All independently owned and run by individual hoteliers, no two are the same except in their devotion to your comfort and convenience. Secluded inns, imposing country houses, historic castles, grand city-centre hotels – you name it, Best Western have it. So next time you feel like a break in your favourite corner of Britain, escape to Best Western. offers help to those who have problems with their health? promotes a network of hotels? promotes the whole country as a tourist attraction? has a deadline for reservation? mentions historical heritage as a tourist attraction? mentions the opportunity to see glaciers? 5. So next time you feel like a break in your favourite corner of Britain, escape to Best Western. The British Isles consist of two large islands – Great Britain and Ireland – separated by the Irish Sea, and a lot of small islands, the main of which are the Isle of Wight in the English Channel, Anglesey and the Isle of Man in the Irish Sea, the Hebrides – a group of islands off the north-western coast of Scotland, and two groups of islands lying to the north of Scotland: the Orkney Islands and the Shetland Islands**. The national flag of Wales is a red dragon on a background of white and green. Wales is not represented in the Union Jack because when the first version of the flag appeared Wales was already united with England****, but the Welsh flag is in widespread usage throughout that country. A red cross acted as a symbol for many Crusaders in the 12th and 13th centuries. It became associated with St George who’s claimed to be the patron saint of England (the saint’s day – 23 April). The red cross remained in national use until 1707, when the Union Flag was adopted for all purposes to unite the whole of Great Britain under a common flag. The rose as the national flower of England is used in a variety of contexts. Predominantly, this is a red rose (which also symbolises Lancashire), such as the badge of the English Rugby Union team. However, a white rose (which also symbolises Yorkshire) or a red-and-white “Tudor rose” (symbolising the end of the Wars of the Roses*) may also be used on different occasions. St Andrew is the patron saint of Scotland (the saint’s day – 30 November). The national flower of Scotland features in many Scottish symbols and logos, and UK currency. 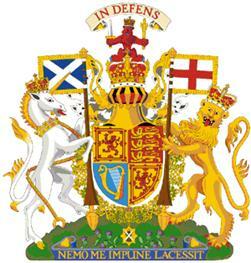 It is also used as the emblem of the Scottish Rugby team. It is believed that the leek, if eaten, encourages good health and happiness. This plant, which was worn by the Welsh in the Battle of Crecy**, by 1536, when Henry VIII gave a leek to his daughter on 1 March, was already associated with St David’s Day. It is possible that the green and white family colours adopted by the Tudors were taken from their liking for the leek. The daffodil has only recently assumed a position of national importance. An increasingly popular flower during the 19th century, especially among women, its status was elevated by the Welsh-born prime minister David Lloyd George, who wore it on St David’s Day and used it in ceremonies in 1911 to mark the investiture of the Prince of Wales at Caernarfon. The shamrock is often confused with the four-leaf clover. While the four-leaf clover is a symbol of good luck, the three-leafed shamrock is mainly an Irish Christian symbol of the Holy Trinity and has a different significance.